Quick Strike – As we waited anxiously yesterday for the start of the season’s first game, my texting with Tbone and the Gman devolved into the most banal of all conversations: what would be our first play call. I stated we would run one nondescript running play and then HBC would take a shot deep on the second play. I was way off, it was the third play. Long live the HBC. #Clowneygassed – Patting myself on the back for a second time already, here is what I said in our TRC Unleashed podcast earlier this week. And here is the moment it happened. Commentary on Clowney tonight is what happens when the nation suddenly spends a game watching a defensive lineman. It's a grind in there. The ESPN crew was probably over-critical, the Twitter defense of Clowney swung too far to the other side. The truth is somewhere in between. I think there is a little reason to be concerned, especially considering a 4:30 kick next weekend at Athens. But at the same time I believe by game four of five we will have forgotten the topic altogether. Tremendous credit to Clowney in the presser by the way, basically saying “I know you want to talk about my conditioning, let’s go.” He has become so comfortable with the media, and will take them head on when necessary. I Repeat, Long Live the HBC – On USC’s first possession after the Mike Davis 75-yard touchdown, up 27-10, it appeared the Gamecocks were going to ground the Tar Heels into a fine powder. 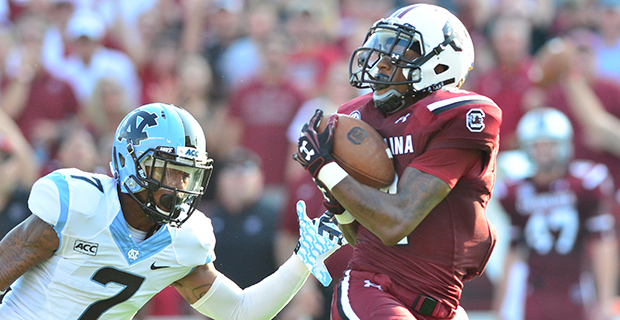 USC ran eight plays for 49 yards, including 34 on five carries for Brandon Wilds to move into Tar Heel territory. Then, on the last play of the third quarter, Spurrier decided to go for the throat. Connor Shaw was sacked for a 10-yard loss, essentially killing the drive. Why look long ball when you’re asserting your dominance at the LOS? Because you’re Steve Spurrier, and methodical, soul-killing ground and pound drives don’t hold a candle to a quick, soul-killing fly pattern for a TD. Just another reason to ❤ him. Player and Play of the Game – Mike Davis went 12-115 and this touchdown. It’s been a long time since we’ve seen a breakaway run like that from someone in a Gamecock uniform, and Davis’ speed was unexpected and impressive. Honorable mention to Connor Shaw, whose numbers won’t jump off the page, but had a typical Connor Shaw game. Just do us a favor and slide, son. Second honorable mention to Brandon Wilds, who looked super. The Legend of Kane Whitehurst – Much was made of Kane Whitehurst the first two days of fall practice, then he fell off the radar as other guys took center stage. But on one of his few plays Saturday night he got behind his defender and shakily hauled in the first touchdown catch of his career. Now, before you get too excited, he was the third option at best on the play, and there was an obvious breakdown in the UNC secondary. Still, it was a lot of fun, and hopefully he’ll continue to get opportunities to show what he can do. Fast-paced and Low-impact – As was pointed out in the post-game last night, UNC was held to ten points even though they ran 79 plays. They were also held to 293 yards of total offense after gaining more than 400 yards in every game in 2012. Personally, I was especially happy we didn’t give up a garbage touchdown late. Those always seem to put a little damper on things. The Dirty North (Carolina) – I will give Larry Fedora the benefit of the doubt and choose to believe he doesn’t teach these things to his players, but the Tar Heels had two egregious “dirty” plays last night. First, there was this hit on Victor Hampton which was inexplicably not flagged. And then, late in the fourth this clip by offensive lineman Kiaro Holts on Clowney, which was not just dirty, but DIRTY. I’m all for protecting players and flagging obvious head shots, but targeting of the lower body needs to enter the conversation at some point. What if one of Clowney’s feet had been planted when Holts intentionally rolled into him? We could have lost him for next week, or God forbid, much longer. D.J. Swearinger had a point when defending himself from criticism of his hit on Dustin Keller: if you tell players they have to go low to avoid penalties and suspensions, then you better be prepared to deal with more broken legs and knee surgeries. It will be interesting to see if the ACC or Larry Fedora do anything to either of the offending UNC players this week. Where’d I Put That Gameday Roster? – One very pleasing outcome from last night was all of the jersey numbers I didn’t recognize on defense. We needed to be deep because of the heat and humidity, and not only did a lot of guys play, but the vast majority played well when they were in the game. We have some work do do on securing tackles and pursuit angles, but the play of the new guys was encouraging. Freshman Skai Moore with six tackles, BTW. Gamesmanship – With less than a minute to go the HBC threw a deep ball towards Pharoh Cooper that Fedora didn’t appreciate so much. (Spurrier’s excuse was a little lame, if he wanted to get Cooper the ball because he was from North Carolina there are a myriad of short patterns he could’ve run. He obviously wanted to twist the knife. Again, <3.) In turn Fedora called a timeout with five seconds left. Spurrier then called his own timeout with five seconds left. I was hoping Spurrier would go long again, but he decided to punt it away. It is doubtful this will be forgotten come 2015. Injury Report – J.J. Marcus appears to be done for a while after he dislocated a shoulder, and J.T. Surratt has a foot contusion and is questionable for next week’s tilt against Georgia. Victor Hampton narrowly escaped being murdered on multiple occasions last night. Enjoy your weekend folks, big game next week.